This infrared image of Europa, showing heat radiation from its surface at a wavelength of 27 microns (millionths of a meter), provides the best view yet of Europa's daytime temperatures. Temperatures, derived from the brightness of the infrared radiation, can be determined from the colors by reference to the scale at the bottom of the image. The image, taken by NASA's Galileo spacecraft, shows the full disk of Europa, highly distorted by the relative motion of Europa and the spacecraft, centered on longitude 190 degrees, with north at the top. The data show that midday temperatures at Europa's equator reach about 130 degrees Kelvin (-225 F). The surface is even colder toward the poles and before or after midday. Small patches of different colors on Europa's disk show regions that are warmer or cooler than their immediate surroundings: the warm patches are generally relatively dark, and thus absorb more sunlight, than neighboring regions, while the cool patches are relatively bright. In the lower left corner, heat radiation from Jupiter itself, appearing orange-red in this representation, can be seen peeking out from behind Europa's disk. The image was taken with Galileo's PPR (Photopolarimeter-Radiometer) instrument on the spacecraft's seventh orbit around Jupiter, from a range of about 65,000 kilometers (40,389 miles). Surface temperatures derived from the strength of infrared radiation, as was done here, are called "brightness temperatures," and may be slightly in error. 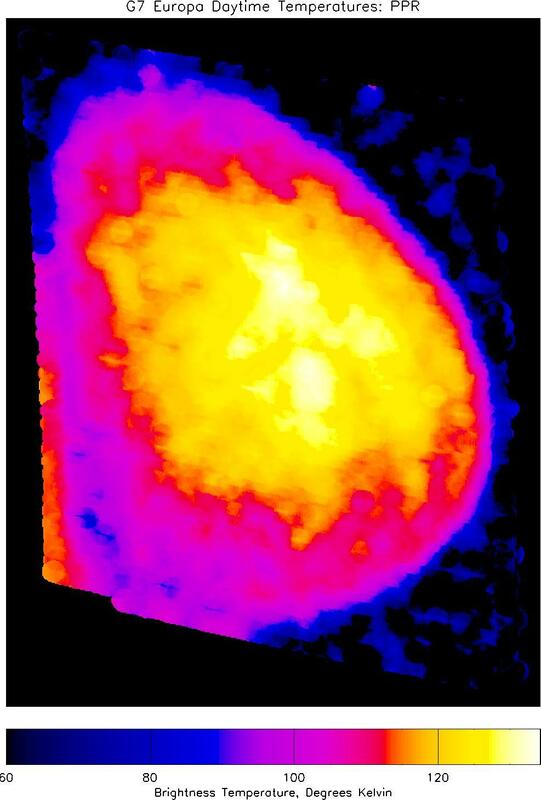 The PPR instrument builds up an image by slowly scanning across the target over a period of up to one hour. The motion of Galileo relative to Europa during this time causes distortions in the satellite shape on the image, which therefore does not appear circular. The small overlapping circles that make up the image show the size of the area, about 160 kilometers (99 miles) across, covered by each individual PPR measurement. 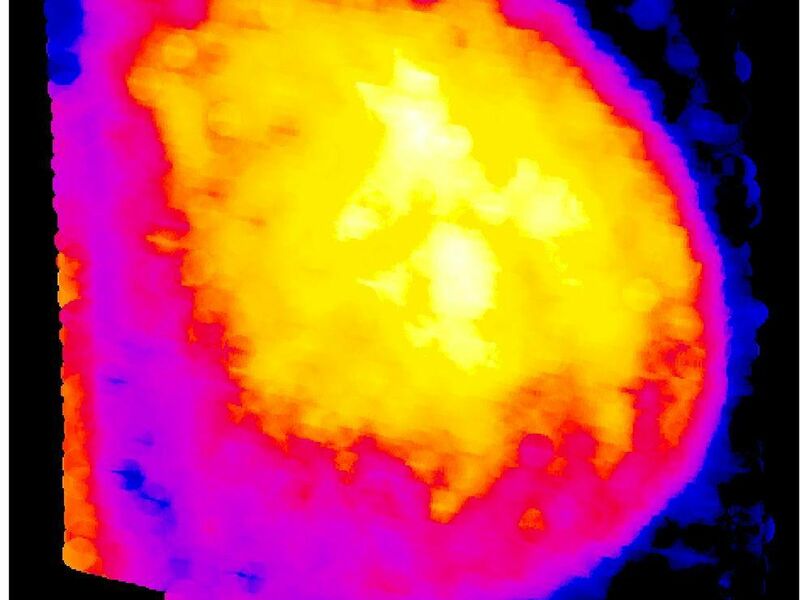 Blue spots in the dark sky in the right-hand portion of the image are due to noise. JPL manages the Galileo mission for NASA's Office of Space Science, Washington, D.C.